Doughnuts are always a good way to start the day. Unless being healthy is your goal of course. I crave cinnamon during the Fall season, especially if they’re part of a doughnut. These Fall cool crisp mornings are the best with a cup of hot coffee and yummy fattening treat. These doughnuts are baked and not fried. Meaning that they are moist and cakey, and not heavy or greasy. They are seriously one of the best doughnuts I’ve ever made. In fact, this is the same basic recipe as the crumb doughnuts that I made last year. 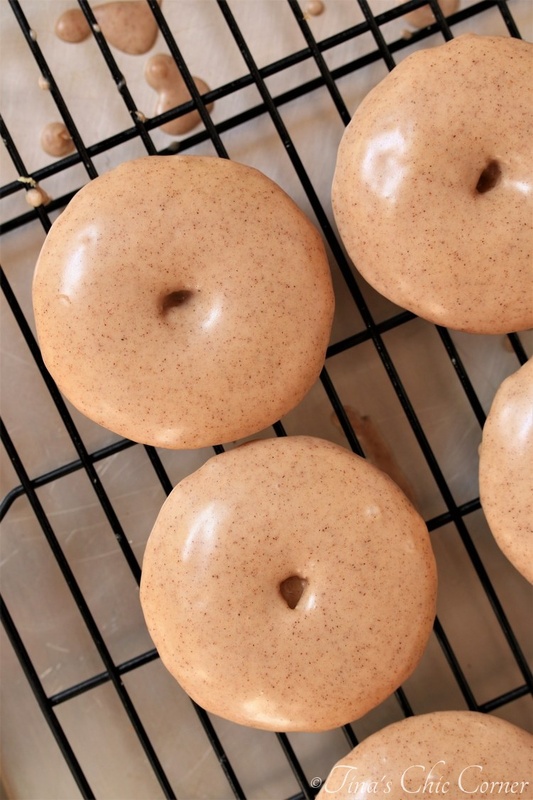 Adjust the glaze a little and get rid of the crumbs and you’ve got an all new doughnut. It’s so different tasting that my husband doesn’t even like these, but loved the crumb version. Yes, the crumb queen omitted one of her favorite things in the entire world, but I wanted a smooth frosting top this time (and I’ll show you why in a separate post). I love seeing all the cinnamon specs in the frosting. It’s so pretty and of course tasty. I would say that the frosting is good enough to eat straight with a spoon (just guessing 😉 ). I typically show you the inside of everything that I make. I like to see those kinds of pictures when I’m baking (especially if it’s a new recipe to me), so I figure you might too. However, I made these doughnuts for a special occasion and this time I wanted to make sure that every single doughnut made it to the platter. If you are curious, then check out the crumb doughnuts post because you’ll see a great inside shot there. 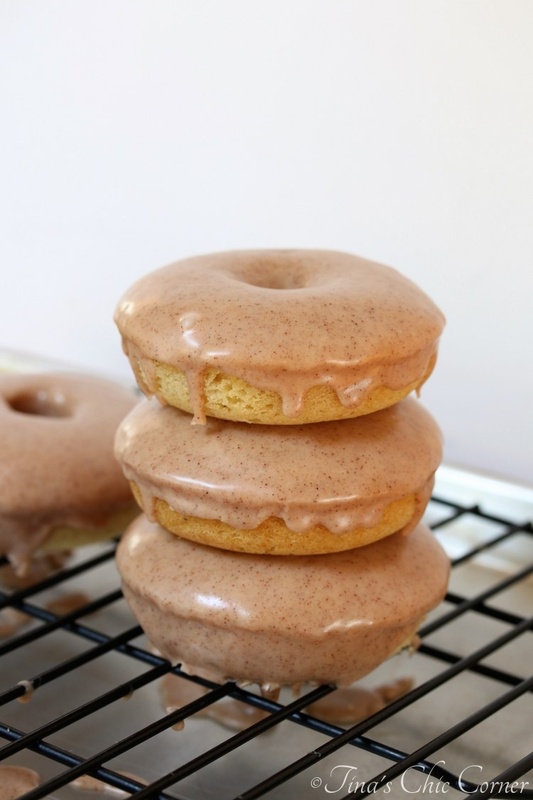 I’d really love to find a good (baked) cinnamon sugar doughnut recipe. See, there I go with my cinnamon obsession again. 😉 Does anyone have any suggestions? Preheat the oven to 350 degrees F. Grease a doughnut pan and set it aside. In a large bowl, whisk together the flour, baking soda, salt, and nutmeg. These are the dry ingredients. In a small bowl, whisk together the oil, sour cream, egg, and vanilla extract. These are the wet ingredients. Pour the wet ingredients into the large bowl of dry ingredients and stir until just combined. Don’t over mix the batter. Pour the batter evenly into 6 greased doughnut cavities. Let the doughnuts cool and then remove them from the pan. Get a wire rack and lay parchment paper or a cookie sheet underneath it. This is the prepping station for glazing steps. Make sure they are cooled completely. 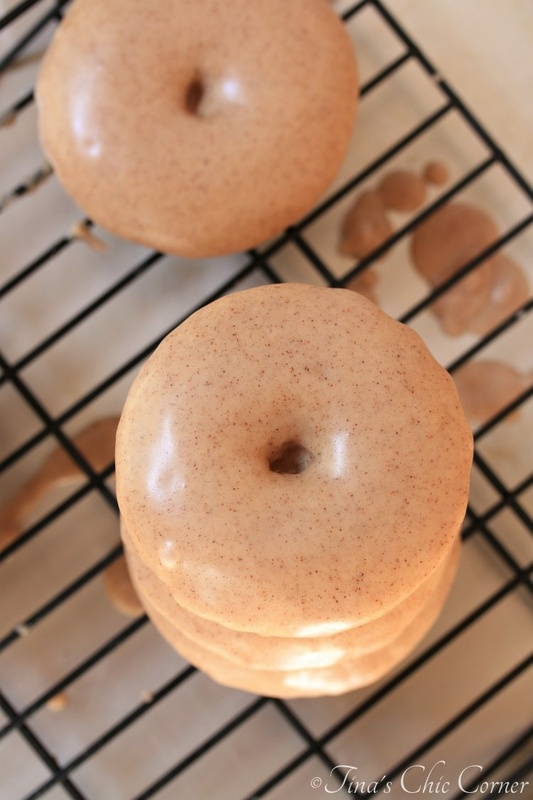 Dunk the doughnuts into the glaze (recipe below), covering the top of the doughnut. Place the glazed doughnut onto the wire rack. Let the doughnut stand until the glaze has set. Repeat steps 10 and 11 for each doughnut. In a medium bowl, whisk together the powdered sugar, cinnamon, vanilla extract, and milk. Set it aside to use for when the doughnuts have cooled completely. Yummy, Tina! I love cinnamon, also….in taste or a scent. Isn’t it so good?! I even put some cinnamon in my coffee now!